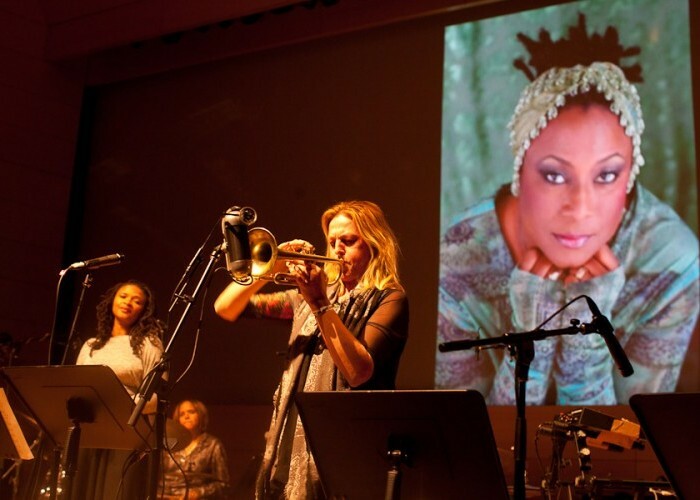 Trumpeter Ingrid Jensen performs at the star-filled tribute to Geri Allen at Winter Jazzfest in New York. On the evening of Martin Luther King Day, Jan. 15, the New York City Winter Jazzfest hosted a splendid and heartfelt all-star tribute concert to Geri Allen, whose death from cancer last June at the age of 60 shocked and saddened the jazz world. As revered as she was among musicians, Allen was underappreciated in her lifetime, despite having been deeply influential to a generation of young jazz players and a shining example of how jazz can embody a sense of spirituality, nobility and commitment to the human family. She seems finally to be getting her due. Some of that might be our lamentable tendency to value artists more in retrospect than in the here and now. Some of it probably had to do with her gender in a male-dominated field. Context is everything: Amid raw feelings and public outcry over racist sentiments coming from the highest office in the land, as well as the reinvigorated feminism inspired by the #MeToo movement, the stars seemed aligned to celebrate Allen and the virtues she represented. Besides Carrington and Iyer, the participants included pianists Kris Davis, Helen Sung and Craig Taborn; bassists Kenny Davis, James Genus, Linda May Han Oh and Esperanza Spalding; singers Dee Dee Bridgewater and Lizz Wright; drummers Jaimeo Brown, Jack DeJohnette, Kassa Overall and Jeff “Tain” Watts; trumpeters Ingrid Jensen, Nicholas Payton and Wallace Roney Jr. (Allen’s son); saxophonists JD Allen, Ravi Coltrane and Tia Fuller; guitarists Paul Bollenback and Chris Sholar; percussionist Mino Cinelu; and tap dancer Maurice Chestnut. Activist/scholar Angela Davis and actor S. Epatha Merkerson served as co-emcees. It began with a film of Allen playing “Flying Towards The Sound,” a rhapsody for solo piano, full of meditative rumblings and fiery arpeggios that ultimately resolve into a solemn, haunting nocturne. As the film’s music began to fade after a few minutes, Taborn, seated behind the hall’s Steinway grand, seamlessly took over—a metaphor for the continuity of Allen’s vision. Brown performed his moving “Power Of God,” on which Allen had played piano, blending a sampled spiritual (by the Gee’s Bend Quilters Collective of rural Alabama) with jazz, deep blued riffing coming from Allen and Sholar. Davis, citing Allen as a major advocate for women jazz players, introduced Carrington, Oh, Fuller and Davis to play Eric Dolphy’s frenetic “Miss Ann.” Dolphy was the subject of Allen’s master’s thesis in ethnomusicology. Allen’s “Drummer’s Song” from 1987, featuring Iyer, was compelling with its hypnotic melody and insistent polyrhythms, especially an impassioned alto solo by Fuller; it was one of the evening’s early highlights. Frequent Allen collaborator Watts, accompanied by Bollenback and Genus, followed with a pair of his own songs. The trio was locked in but loose, tossing the beat around like a football. “RTG,” originally written for Allen’s trio with Ron Carter and Tony Williams, was played by the “TEN Trio” of Carrington, Spalding (on bass and vocals) and Payton (alternating between piano and trumpet). Easing into Allen’s “Unconditional Love” from the album Twenty One, Spalding conjured Allen’s presence as she intoned, “Trust the sound is Geri … in the presence … in the absence … the presence surrounds us.” It was almost like a jazz séance. She followed with a wailing, virtuoso vocal improvisation, singing with an almost reckless abandon that brought many in the audience to their feet. There were more gifts to come: Coltrane performing Allen’s “Swamini,” written for his mother Alice; “Your Pure Self, Mother To Son,” written for and played by Allen’s son, trumpeter Roney; a medley of “Feed The Fire” and “Lover Man” from Allen’s tenure backing singer Betty Carter. The latter were sung by Bridgewater, backed by Kenny Davis, DeJohnette, Taborn, Jensen and Roney. “Lover Man” pointedly reprised a previous era of the avant garde, as Carter deconstructed the classic, fragmenting and elongating the beat and wringing maximum expression out of each note. A recreation of Allen’s Timeline Band played Charlie Parker’s “Al-Leu-Cha,” with Overall, Kenny Davis, Chestnut and Sung substituting for Allen. In an evening of extraordinary pianists, no one seemed to embody the fire hydrant of creativity and technical perfection that was Geri Allen more than Sung.